Open the sliding glass door and let your Outer Banks vacation begin. As you step out on your second floor balcony, your eyes are immediately drawn to the shimmering ocean across the street. Listen to the rush of the waves as they flow in and ebb back out again. A perfect, soothing rhythm. 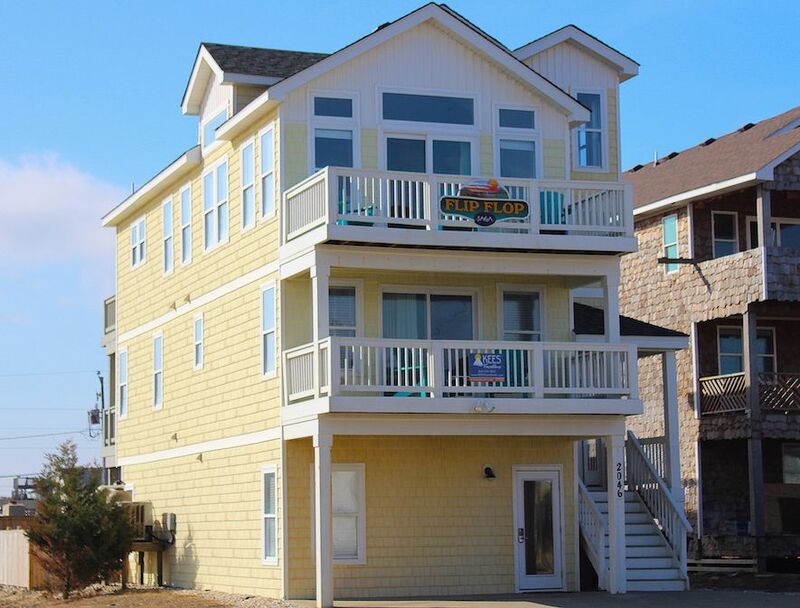 Flip Flop is your vacation home on the Outer Banks. It is perfect location at MP 6.25 in Kill Devils Hills means it is a stone's throw away from all of your favorite restaurants, shops, activities and amenities. With 5 bedroom, 5.5 baths and two separate indoor living spaces, as well as the incredible pool deck, everyone will be able to claim their own special spot to find a few minutes alone! Flip Flop's upside down design, with its living area on the second floor, means that you get to enjoy those stunning views as you all hang out together in the spacious great room. This lovely, spacious area feels even larger thanks to its high ceilings, airy feel and bright, coastal decor. A few pops of unexpected color are a fun and flirty addition! Gather the group around on the sectional sofa for a movie night. Or, maybe just to catch up on the day's adventures! The spacious kitchen features cool tile floors with all the appliances, cookware and gadgets to create a gourmet feast for the group. That feast can then be served at the generous dining table with seating for 10. A King Master suite, as well as the half bath, are located on this level. The first level is home to 3 King Master suites. The ground level is where a lot of the fun happens! The pool sharks in the group will enjoy hanging out in the recreation room with a pool table. This area also features a wet bar with a full-size refrigerator, a pub table for 2 and a sectional sofa overlooking a big, flat screen TV. Might just be the perfect spot to watch that big game! This level also features a bedroom with two sets of full over full bunk beds and a full bath. And the pool deck, ah, yes. The spot where hours of fun will be had by all! Work on your vacation tan as you float around in the sparkling cool water. Or stretch out in one of the sun loungers as you catch up on the latest bestseller. There is a good sized grassy area to toss a ball around or maybe even practice your yoga! The 6-8 person hot tub sits ready to help melt your stress away in its bubbling warm water as you gaze at the stars over the Outer Banks and wonder why there are so many more here. That's easy - the stars shine brightest where there is the most magic. All bathrooms have the KEES amenity dispensers with soap, shampoo, and shower gel. Nice home, well appointed, perfect for families. Very much enjoyed our stay. The layout of this rental is PERFECT. Each bedroom is spacious and has it's own bathroom and deck, the common area on the third floor is warm and inviting, and it had all the amenities of home. We rented it for a girl's weekend and we couldn't have been happier with our choice. We had an issue with the hot water (likely because it is very early in the season), but Kees responded quickly and it was resolved in a few hours. Regarding the location - it's right across the street from the beach (short walk to public access by Avalon Pier) and a short drive to shops, restaurants, the grocery store, etc. Kill Devil Hills is close to other charming towns (Kitty Hawk, Nags Head, Duck...) which makes for fun day trips. During your visit, be sure to grab a salad at Barefoot Bernie's and burgers at Jack Brown's. Seriously good. You won't regret it. Enjoy! Adorable house with a nice decking on the front. Indoor decor is lovely. Nice to have the second seating area downstairs. Pool is very refreshing and I'm sure hot tub would be wonderful if not 98 degrees outdoors :) Backyard is perfect for corn hole and other family outdoor games!! A couple of suggestions would be to add some sort of gazebo or other sort of coverage by the pool area on the southern end concrete next to the fence. Also, a mirror (perhaps full length) in each bedroom would be helpful. We were concerned about your dining table but could not find placemats. Overall, very nice house and would recommend for single family or couple's getaway. Thank you for the feedback and great recommendations. We are glad that you had a lovely vacation and cannot wait to host you again soon! We were very happy with the cottage. It was very clean and spacious and a great set up with the 5 bedrooms and 6 bathrooms. Great selection of dishes and cookware and utensils. A great place to stay and we hope to spend our next vacation to Kill Devil Hills there. Centrally located and easy to get to all the attractions. Especially enjoyed the ocean view from the cottage balconies. A fun place to stay! Thank you for providing us with some feedback. We are thrilled to hear that you had a great vacation and hope to host you again soon! We stayed at "Flip Flop" for a family vacation in late April and were pleased with our experience. Prior to our stay, the rental company (Kees Vacations) was efficient and communicated well via email and phone, and the entry code they gave us was correct and timely.The house is 1 block from the beach in Kill Devil Hills, close to the Wright Brothers National Memorial and a few short miles from Jockey's Ridge State Park. The house is large, airy, and clean, with beautiful light. Each of the bedrooms has its own bath, which was very convenient. The small pool table on the lower level was a nice diversion on our one rainy afternoon. The hot tub was clean and in working order. We made use of the gas grill, which was clean but had only one working section. A few minor issues: (1) the dishwasher leaked a bit and we had to keep a towel on the floor while it was running, (2) we had only two kitchen towels for our stay of 4 nights, which, combined with the dishwasher leak, created a minor problem re not having enough clean towels while cooking and cleaning up, (3) though the kitchen was well stocked with cookware, utensils, and dishes, there were absolutely no cooking staples, so if you plan to cook at all, be prepared to bring your own salt, pepper, spices, condiments, cooking spray, etc., (4) there's currently a large vacant lot next door that isn't especially attractive, and (5) parking is limited to two cars (possibly three small cars) for the entire house, which was not a problem for our group, but could potentially be for others with more drivers with large vehicles. Overall, though, this was a great house for our first visit to OBX. We'd definitely rent the place again. Thank you for taking the time to write us a review. We have created work orders for the inconveniences that you have mentioned, but we are glad that you had such an enjoyable vacation. We are looking forward to hosting you again soon! Experience the history and natural wonder of the Outer Banks in Kitty Hawk, Kill Devil Hills, and Nags Head. This area of the Outer Banks offers an endless variety of activities from nearly 100 miles of glittering beaches, a vast array of water sports, hunting and fishing, historical tours, golf, to shopping and dining. OBX truly offers something for everyone. Just moments from a plethora of activities, Dare County is the perfect destination for active and adventurous travelers.